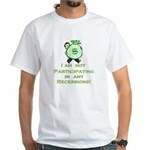 I AM NOT PARTICIPATING ~ Just Say No To The Recession! - Wealth ~ Abundance ~ Joy NOW! Wealth ~ Abundance ~ Joy NOW! I AM NOT PARTICIPATING ~ Just Say No To The Recession! Are you participating in the current recession or are you living from your perfect economy and creating abundance for yourself? Have you said NO to the fear, gloom and doom that is everywhere? Are you living from Joy and Prosperity? Tell the World! Be an inspiration. And when they ask you "how"? You can tell them! Perfect conversation starter and intention reinforcement. Just Say No To The Recession! You Are A Money Magnet! Declare to the World that You Don't Participate in any Recessions! Shirt is infused with Money Reiki to attract abundance to you! 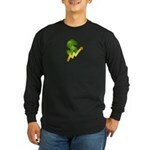 Soft and silky comfy warm Long Sleeved T to DECLARE to the world that you don't particpate in recession! And your Money Bag says it all! Infused with Money Reiki to attract prosperity to you! 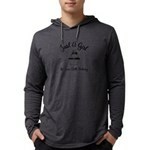 DECLARE to the world with this Warm and comfy Hoodie that you don't particpate in recession! Your Big Bag Of Money says it all! PLUS infused with Money Reiki Healing to attract prosperity to you! My Economy is Perfect! Tell the World a HOW PERFECT your economy is with this cute and cozy smaller hoodie! For kids,tweens or small adults. 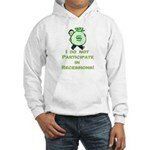 Hoodie is infused with Money Reiki Healing to attract $$ ! My Economy is Perfect! 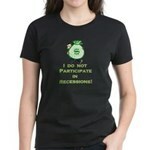 Fun Sweatshirt reminds you that you don't participate in Recessions and lets the rest of the world know too! Sweatshirt is infused with Money Reiki Power to attract more prosperity into your life. Make It Clear! You Refuse to Participate in Recessions! Infused with Money Reiki Energy to turn you into a Prosperity Magnet! Tell the World that You Are NOT Participating in Recessions! Display Your Prosperity. Shirt is infused with the Money Reiki to turn you into a prosperity magnet! Let People know what's on the top of your mind, Your Prosperity is Rising Cap! 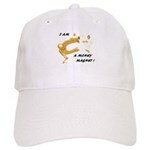 The cap is infused with Money Reiki healing and turns you into a Powerful Money Attractor! My Economy Is Perfect! Cool Mug! My Economy is Perfect! 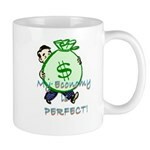 Tell the World a HOW PERFECT your economy is with each sip! The Mug is infused with Money Reiki Healing to attract prosperity. Share Prosperity and Your Perfect Economy with colleagues, friends and family. Inspire them! My Economy is Perfect! Cards are Infused with Money Reiki to attract money to all recipients! SIGN UP Free Money Reiki Healing! 💰Use the Money Reiki Mp3 to Tune In and Activate 😁ABUNDANCE! 😖 Are You Guilty of Using Bad Language? March 20 2015: Very Rare Convergence of 3 Powerful Cosmic Events! ♥ The Sun Sent the Earth a Heart of Love! And Why it Might Make You Feel Weird! Wow! The Incomparable Joy of Goat! The Special Gifts of Mercury Retrograde! MORE Money Reiki Healing For You! Click Below! Your Wealth ~ Abundance~ Joy NOW! Money Reiki Healing products for your expansion, clearing and empowerment in the area of money flow in your life! Integrate Money Reiki or Attraction Reiki Energy into your life to open to the flow of money and empower your attractive energies. Live, Laugh and Spread Joy with "Oh Long Johnson"! Wacky Talking Cat "Oh Long Johnson" Spreads Joy & Laughter! He's attracted a legion of loyal fans worldwide, and it's no wonder... he is a source of JOY! From the very first "Oh my Dog..." he found his way into our hearts. 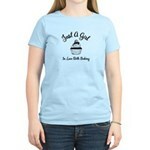 Now we can enjoy celebrating our love for Oh Long Johnson with Oh Long Johnson clothing and gifts! A Very Powerful Money Reiki Healing Meditation ! Holosync ~ Meditate Like a Zen Master Effortlessly! "700 Words" by Story Waters~Download Poster Here. Download the Magnificent 700 Words Poster by Story Waters ~ Remind yourself of Who you are. CLICK HERE TO OPEN in window, RIGHT CLICK HERE & Save to download. Additional FREE eTools For Abundance NOW! Free e-Books to Create Your Abundance NOW! You will need Adobe PDF Reader to view. THE BOOK that Inspired "The Secret"! The Great Wealth Pandemic! -- Create Abundance and Wealth freely! Copyright © Wealth - Abundance - Joy NOW! and Amy Flynn 2019 All Rights Reserved.